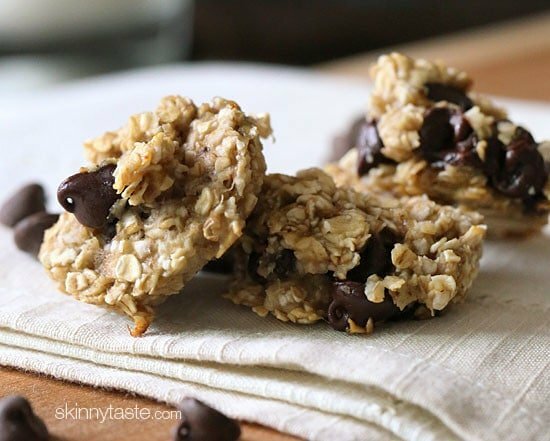 Oats, ripe bananas and chocolate chips – these healthy, “breakfast” cookies are chewy and delicious, and made with just three ingredients. I was craving chocolate this morning, and decided to whip up a batch of these yummy cookies for breakfast (I ate 4 cookies, for 4 points). Some of you may recognize them, in the past I made them with walnuts in place of chocolate chips. I would never eat cookies for breakfast, but these are made with healthy ingredients – oats, bananas, and a handful of chocolate chips (antioxidants, right?) with no added sugar or flour. If you wanted, you could replace the chocolate chips for cocoa nibs, raisins, craisins, whatever! Perfect for breakfast, snack or any time you crave a sweet healthy treat. And these are nut-free, gluten-free and egg free so they are perfect for different diet restrictions. The riper your banana the better, so make these when your bananas are almost black and freckled with dark spots. I personally think these are best eaten warm, right out of the oven. They taste almost like mini banana bread muffins, the texture is soft and chewy, not crisp like a dessert cookie. If you’re expecting a crispy cookie you would keep in your cookie jar – you WILL be disappointed. But if you have a very ripe banana hanging around your counter, and you are craving chocolate… make these! You will be happy you did. 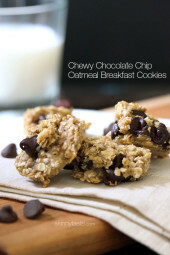 If you want more of a “traditional” oatmeal cookie recipe, then try my Low Fat Chewy Chocolate Chip Oatmeal Cookies instead… but I wouldn’t eat them for breakfast. Preheat oven to 350°F. Spray a non-stick cookie sheet with cooking spray or use a Silpat. 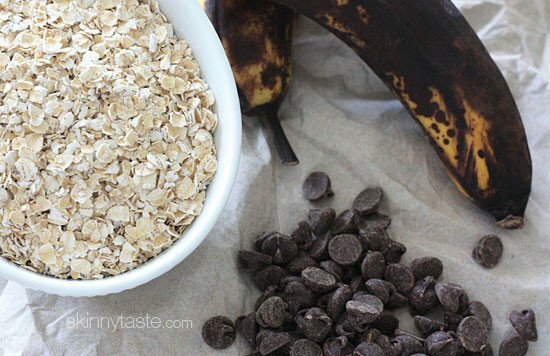 Combine the mashed bananas and oats in a bowl. 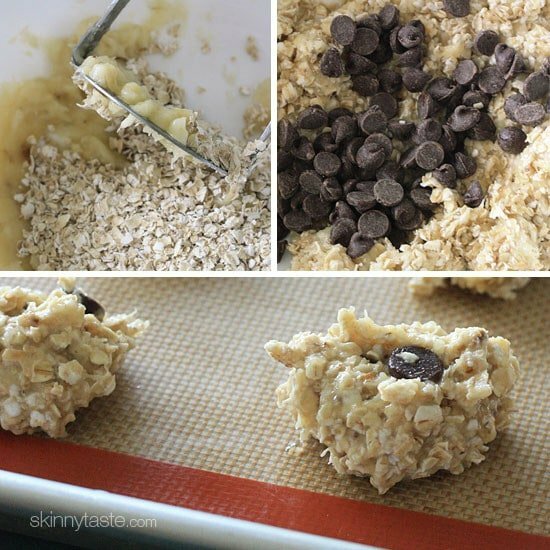 Fold in the chocolate chips and place a tablespoon of each on the cookie sheet. Bake 15 minutes. Makes 16 cookies. *Use gluten free oats such as Bob’s Red Mill quick oats to make them gluten free. Has anyone tried these with canned pumpkin? These were yummy, and they did NOT spike my sugar. I am a type II diabetic, so I used sugar-free chocolate chips and a healthy dose of cinnamon the first time I made them. The second time, I made a batch for my work lunch snack break. This time I used some no sugar peanut butter (2 T) in place of the cinnamon. I usually use overripe bananas for sugar-free walnut banana bread, but these were faster. Thanks! Made them last night. Had a couple then and thought they were ok but wouldn’t make them again. Sprinkled a little colored sugar on to add a bit to the taste. Put the rest in refrigerator to try in the morning. Liked them much better cold and WILL MAKE AGAIN. Such a simple and tasty recipe. I might add just a bit of sweetener but the sprinkles worked. Will probably try adding different things as well . Pretty tasty. I added about a teaspoon of applesauce to sweeten them and used milk chocolate chips. Love these they’re delicious and simple, but how do you store them? Do they have to be refrigerated? They are best eaten right way but I think freezing them might work! I freeze them, then put a couple in the toaster oven and toast, when I’m craving sweet. Taste just like they did when they came out of the oven! I only have old fashioned oats. Can I use these instead of quick oats??? I used peanut butter chips & chocolate chips & a little vanilla. They are great!! 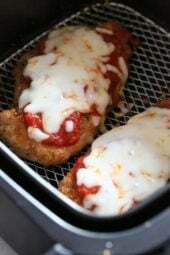 Love this recipe!!!! Quick and delicious!!!! Whole family enjoys them!! How would you store these? I accidentally bought steel cut oats for this. They are quick ones. Will they still turn out? I have bananas I want to use! Thanks! 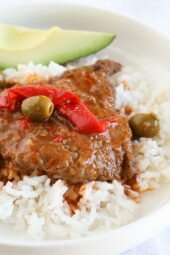 I have loved every skinny taste recipe I have tried (and I’ve made a lot!!) thank you for making healthy eating so much easier and enjoyable. I love to cook and was tired of baked chicken and vegetables routine and your recipes have given me so much joy, to cook and eat and feel good!!! Love these cookies! Also gave a few friends your cookbook for Christmas! Keep the recipes coming! OMG these are delicious! Just made them and by 21 yr old son loved them. He said they are so healthy and he had 5! He is an athlete so he is very health conscious. Could you use reasons instead of chips ? Just put this recipe info in my WW app and it calculated 4 smart points? Is that right? You have to use recipe builder to get accurate points, the calculator will add points to 0 point foods in the n.i. I have now made several of your recipes. All I can safe is DELICIOUS! MAKES EATTING HEALTHY so much easier!! I made this breakfast cookies and double the recipe however didnt realize I only got 12 per pan total of 24 when I should of gotten 32. Do you know what the ww points would be now? Can I substitute old fashioned oats for 1 minute quick oats? These are delicious. Made them exactly as called for. Love the texture. Perfect amount of sweetness. My toddler loves them too. They are so good. Used Raspberry Chocolate chips instead of plain chocolate chips and it added another depth of flavor. Wonderful recipe! I’ve struggled to find a mid-morning snack to replace my Kind bars (even the minis are 4 points). I’ve learned to live without and have been ok but I have caved a couple of times and eaten one. But I think these bites will be the perfect replacement. Thank you! They are so good….my 6 year old loves them! Do these need to be refrigerated or can they be stored in an airtight container? Absolutely delicious!!! So easy to make what a tasty treat. Great breakfast cookie. Greatly appreciated that you advised regarding the texture so it was expected. I view this less as a cookie and more an easy and tasty breakfast on the go. I chose to add a little maple extract for some extra flavor. Thank you! QUICK EASY AND YUMMMMMY!! MY NEW FAVORITE TREAT! Made it with old fashioned oats and substituted unsweetened coconut and raisins for the chocolate. Was very tasty!! Looking forward to more combinations. I’m wondering if you could add peanut butter powder to this to get added protein and taste without added fat. Are the smart points value for these cookies accurate? 3 smart points for 2 cookies – just entered the recipe in WW. Absolutely delicious! Would make again! Add 5 drops stevia glycerite and you ll have a sweeter result thats still ok for breakfast, no sugar high. 1/4t salt would help too. No salt in a recipe generally means tasteless. Im adding an egg to hold them together too. Why complain about a recipe you didn’t follow? They are delicious if prepared per the recipe. Could I use bananas that are already frozen or would that result in dark mushier cookies? I used 2 frozen, ripe bananas that I thawed and mashed. Worked perfectly and tasted awesome! Just made them and they are delicious!!! I just finished making these cookies as we are feeling the first effects of hurricane Florence bearing down on us! These are delicious, and will be great over the next few days…especially if we lose power and have nothing to eat but canned soup, lol! These are really good for a snack! I got 12 cookies using my cookie scoop and added vanilla extract and cinnamon. They are good! Not too sweet for breakfast. I tried adding a tablespoon of PB2, but I can’t even taste it. So if you’re thinking of doing this, add more, or maybe just top with a smidge of peanut butter before eating to get that taste. I thought they were ok. Very bland, I like the idea of adding a little vanilla or cinnamon. The texture was way too mushy for my kids to enjoy them. Bummer. OK – I am amending my review. The first ones I ate were still warm from the oven and weren’t great, but the longer they sat the better they tasted! My kids ended up eating all of them and I had to make another batch. I made this exact recipe first and we all loved it. I’m on a high protein diet, so I added a smidge of peanut butter and just a dash of cinnamon with the next batch and they turned out great too. Fat? There’s nothing listed. Thanks! What’s the best way to store them? I checked the smart points it’s 4 not 3. there’s several recipes on this site with the wrong points . It doesn’t bother me because I just check the points on the WW site. But a lot of the points are not right. The recipes are the best I’ve ever seen. Are you using the recipe builder? The only accurate way to determine any recipe’s SmartPoints® value is to plug the ingredients into the recipe builder on the Weight Watchers website (Click on “My Foods,” select “Recipe,” and click “Create a recipe.”) which does not count fruits and vegetables in recipes in the calculations as they are now 0 points. Can regulate oats be used instead of quick iats? Can the ‘regular’ steel cut oatmeal be used in this recipe ???? Would like to make these cookies as everyone who has……claim that they are delicious. I just made them with regular oats and they are a little chewy/al dente. Not bad but texture is probably better with quick oats. Hope this helps! 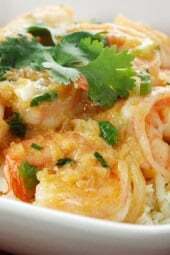 Easy and oh so delicious! These are delicious!! Do they need to be stored in the refrigerator? They didn’t turn out crispy what do I do? It says in the description, they will not be crispy! They are supposed to be soft! These are delicious! I doubled (b/c I had 4 over-ripe bananas to use up) and added 2 tsp cinnamon, 1 tsp vanilla and then raided my pantry for mix-ins. Added coconut, chia seeds, walnuts, and some chocolate chips. Baked for the 15 mins prescribed on parchment lined sheet and they turned out beautifully! They are SO good! My kiddos will love these too! Thanks for the super easy recipe! Will no doubt play with lots of other mix-in ideas! Great ideas! I was thinking cinnamon would be good. Did you measure the cinnamon or just put in a few dashes? I used just a few sprinkles of cinnamon and it turned out great! I like the add in ideas! How much of each? your additions sound wonderful. I immediately thought of adding shredded coconut. I have made these with chocolate chips or walnuts or raisins. Delicious everytime! Do you think fresh blueberries would work or would that make them too wet? I have some berries to use up. Maybe I will try it. If not there is the baked oatmeal recipe you have. Yum! I’m wondering the same! I’m hoping to get some quick breakfasts made before school starts! Sure I think they would freeze fine! These are yummy! They made my girls want to eat breakfast! Thank you! Just made these this morning. It was quick and easy and we will definitely be making them again!! How can these be higher in Points on Freestyle? I don’t understand that. Am I reading it wrong? Thanks!By the way, I’ve made this recipe for years and they are delicious. Probably because the chocolate chips are more pts under freestyle. What could you use in place of the oatmeal? Can you use frozen bananas? OMH just made these cookies !! They will save me from the chocolate cravings ! They are so yummy !!! The recipe says “bake for 15 minutes”. Could you please tell me the temperature at which the cookies should be baked? Thanks.